Lately some friends of mine have played that game of naming records that “changed their lives.” It’s been kicking around in my head. Yesterday, taking shelter from the bitter cold, I decided to fill the CD carousel with my choices. This carousel only holds 5 CDs, so here are the 5. I put them on shuffle and listened to the tracks in a randomized order. All the songs stood toe to toe with each other. All of these records still resonate with me very, very deeply. They help make me who I am today. Yes, really. 1. 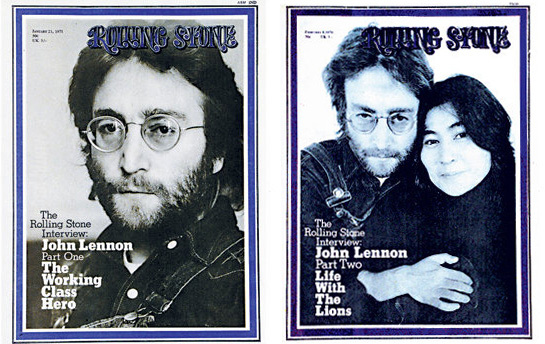 John Lennon – Plastic Ono Band — Lennon’s first post-Beatles record. Stripped down, elemental, brutally real. Powerful, razor-sharp, with great production by Phil Spector. The wall of sound meets r&r minimalism – bass, drums, guitar, piano and Lennon’s amazing, heartfelt, cutting voice. Still brings chills. 2. Bob Dylan – Highway 61 Revisited— A blast of exuberance. Funny, over the top, genre busting. No one ever recorded songs like these before. Dylan fronts an incredible band featuring Mike Bloomfield and Al Kooper. A shock. A blast. Mind-bending. Dylan never sounded more engaged, more intense, more alive and funny. 3. Neil Young – Tonight’s the Night — Shakey’s “dark night of the soul.” A death-haunted record. A great shaggy band of misfits pushed to the ragged edge. Raw, bleak, darkly funny. Neil opens a vein. Spooky and cool. L.A. Dark shades. Bleary nights. The record is filled with flaws, quirks – perfect. 4. The Rolling Stones – Let it Bleed — The Stones at their darkest. Decadent blues, desiccated country. Perfectly realized rock and roll. Jagger and Richards at the peak of their amazing collaboration. Perfectly recorded. Produced by Jimmy Miller. The Stones made other great records, but this one is complete. Flawless. Thrilling. 5. Neil Young & Crazy Horse – Everybody Knows this is Nowhere — Neil emerges into the light with the first, and greatest, Crazy Horse lineup. Danny Whitten on vocals and guitar is the secret weapon. Long guitar jams. Overpowering sound. Produced by David Briggs & Neil Young. Blistering. Raggedy. Elegiac. When the “Horse” kicks it up, there is nothing better.